I meant to file a couple of preview/prognostication pieces before Sunday’s night’s big, big show. But…twas not to be, as a man of the theatre once said. “The Tony Awards are upon us…and where plays are concerned look for the Union Jack to fly high over Broadway tomorrow night. 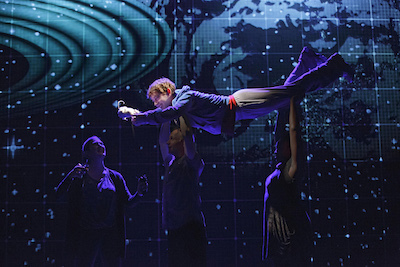 I fully expect to see a British invasion at Radio City Music Hall tomorrow night, with The Curious Incident of the Dog in the Night-Time, which critics and audiences have embraced since fall, feeling the love in multiple categories, including Best Play for playwright Simon Stephens and Best Actor for the deeply affecting Alex Sharp, too. 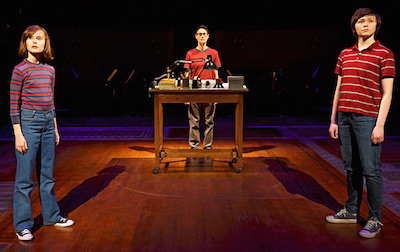 The technical categories should go its way as well–a shame that the Tonys don’t recognize sound design anymore, a short-sighted move on the organization’s part. And it didn’t get much farther than that. But…I was right. I was going to say that the Brits were going to sweep the play awards, and that’s pretty much what happened. In a second piece (such plans!) I was going to say that Fun Home, the musical that best captures the zeitgeist, would romp through those categories. Ka-ching! The “experts” who thought otherwise should stick to their aisle seats and forget about handicapping. The 2015-2016 Broadway season got off to a false start (again, the usual) with the poorly reviewed Jim Parsons comedy An Act of God but Hamilton is just around the corner to shake things up. Lock–unless the Great White Way has a surprise or two in store for us. *Truth be told, I was also wrong, too. But that was then and Sunday night was Sunday night.